Is China Taking Global Leadership from the United States? A Symposium of Views: What Are China's Global Economic Intentions? Nikkei Asian Review, January 11, 2017. China Economic Review, Vol. 40, September 2016. Global Asia, Vol. 10, No. 3, Fall 2015. The International Economy, Summer 2015. East Asia-Latin America Taskforce, Pacific Basin Research Center, Soka University of America, 19 August 2015. East Asian Forum Quarterly, April-June 2015. American security and prosperity now depend on Asia. William H. Overholt offers an iconoclastic analysis of developments in each major Asian country, Asian international relations, and U.S. foreign policy. Drawing on decades of political and business experience, he argues that obsolete Cold War attitudes tie the U.S. increasingly to an otherwise isolated Japan and obscure the reality that a U.S.-Chinese bicondominium now manages most Asian issues. Military priorities risk polarizing the region unnecessarily, weaken the economic relationships that engendered American preeminence, and ironically enhance Chinese influence. As a result, despite its Cold War victory, U.S. influence in Asia is declining. 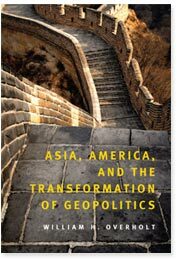 Overholt disputes the argument that democracy promotion will lead to superior development and peace, and forecasts a new era in which Asian geopolitics could take a drastically different shape. Covering Japan, China, Russia, Central Asia, India, Pakistan, Korea, and South-East Asia, Overholt offers invaluable insights for scholars, policymakers, business people, and general readers. In the late 1980s and early 1990s most Americans, including President George H.W. Bush and the CIA, believed that China would collapse and Gorbachev would do great things for the Soviet Union. Throughout the period, Overholt argued that China's reforms would make it a great power again and that the Soviet Union would collapse (an argument Overholt first made in 1976). 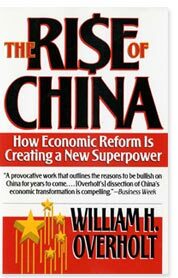 The Rise of China was the first book to argue the case for China's huge success. The reviews mostly said that Overholt's views of China's coming success were absurd. After China's success became a fact, dozens of books have taken up the theme, mostly missing the central points: China emulated successful policies from neighbors like South Korea and Taiwan, so success was predictable. It also faces transitions that those countries had to make, and its continued success depends on successfully making similar transitions.